﻿In the beginning there is noise. Not an encompassing and continuous noise, but something choppy and rhythmical. It sounds as if a noise-generating device is constantly being switched on and off in regular time. It’s a machine-like pulse that stoically keeps its own time, even if none of the instruments, introduced one by one, follow its rhythm. Nor does the bass line, consisting of four notes and played with long pauses, nor the hypnotic tom sequence on the drums. The noise has a life of its own. Its staccatos swell into metallic-sounding harmonies that wander around the room without ever deviating from their tempo. The voice of Cambodian singer Prak Chum floats over it all. Its agility and countless, minute modulations make it seem strange and intimate, grounded and ethereal at the same time. 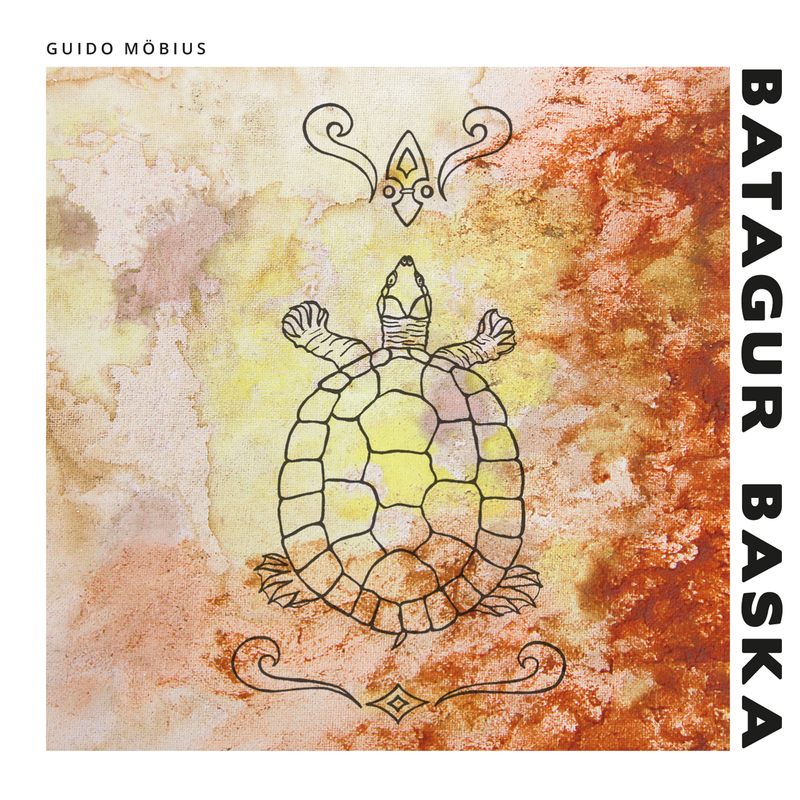 We are talking about BATAGUR BASKA, the first piece from the album of the same name by GUIDO MÖBIUS. Nothing on this album actually goes together. We hear bouncy patterns played on analog synthesizers, and then a recorder. Rumbling, grinding industrial hall percussion develops through vocals played backwards into something like acid Krautrock. In turn, the track CALL THE POLICE NOW, with its shakers and soft vocal lines, has a bossa character. Its warm acoustic pattern is counteracted by the overwrought voice of a woman screaming her lungs out in all fury. Confusingly, this contrast allows something distinct and new to emerge. Such is the ghostly HOW TO NEVER WAKE UP, with a mantra sung by Jana Plewa accompanied by grating and squeaking noises that seem to comment on and object to the voice and lyrics. In any case, for MÖBIUS, it is about the interplay between friction and harmony, sound and noise, and the constant balance between melodiousness and discord that keeps his music in suspense. The path he takes from a pleasant sound immersion to oppressively disturbing noises is a short one. Twisted humor and sacred seriousness are neighbours, as are autonomy, irritation and loss of control. MOLOCH, a nervous track with a swarm of rattling sound snippets, maintains a constant tension so that it appears not as a self-contained work, but rather as a snapshot of a process. It is impossible to predict what will happen next – as is the case with all of the music of MÖBIUS. The tracks of the Berlin-based artist frequently change mood, shifting from mild and friendly to darkly morbid – or the other way around. Everything is organically interwoven, arranged in layers, or opposed. As a noise collector, MÖBIUS has fun losing himself in his pieces and sometimes guiding his listeners in wrong directions. On his first album ‘Klisten,’ he surprised audiences with instrumental music that was equally complex and gentle. MÖBIUS also used predominantly warm, acoustic timbres on his follow-up album ‘Dishoek.’ Although ‘Klisten’ and ‘Dishoek’ manage very well largely without beats and basses, MÖBIUS does make full use of them on his 2009 album ‘Gebirge.’ As on his fourth studio album ‘Spirituals,’ we can hear all kinds of machine noises standing in for snare drums, clanking metal, funk guitars and borderline brass instruments. MÖBIUS works as a PR agent and runs the music publishing house autopilot publishing. His PR clients include record companies and promoters such as SHITKATAPULT, Alien Transistor, Deutsche Grammophon, the Haus der Kulturen der Welt and CTM Festival. As a music publisher, he handles the rights of artists such as FS Blumm, the Trabant Echo Orchestra, Nicholas Bussmann and zeitkratzer.